Cathy Ostlere sits at her kitchen table in Calgary with her family. It is her younger brother, David’s birthday and they are waiting for his call from abroad. Only Cathy knows that he has embarked on another of his grand adventures: sailing with his girlfriend from Ireland to the Azores across the open Atlantic. The voyage is risky, and the phone call never comes. Weeks after David goes missing, Cathy travels to Madeira, the islands where her brother may have landed. The trip stirs up memories of her own youthful travels, and the sharp criticism her brother delivered in her Calgary living room. “Everyone here is wasting their lives. Everyone is the same. No one daring to think that there may be an entire world to move through, not just this sprawling grid of land scraped of all reminders of geography.” When she returns from Madeira, Cathy drops her children off at school on a dull November morning. 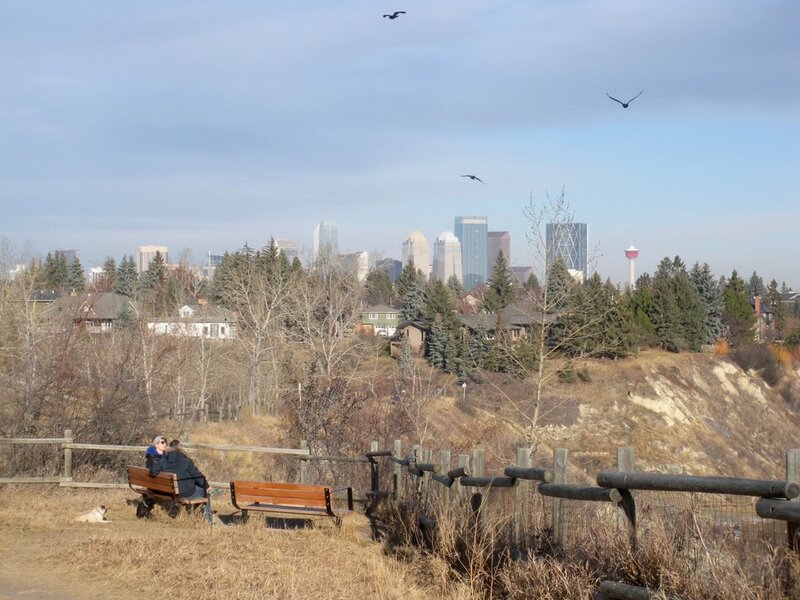 In River Park, she considers the landscape of her Calgary life. In the front foyer of the school I wave off invitations for coffee at Bell’s. I can no longer sustain a conversation. I hear only the echo, not the speaker’s voice. Sometimes I catch the conjunctions –the, and, or – the connecting words, but to what? The sentences are unrecognizable, like a foreign language I’ve never bothered to learn. Someone asks a question, a reply is expected, but I don’t know what we’re talking about. I park the car at the end of 14th Street, dodge the unleashed dogs running like greyhounds and head for the ravine. I walk as close to the edge as I dare. My feet slide. Clumps of crumbled earth slide down to the river. I have returned to a land with three horizons. The first is a line of stubbled earth – the prairie fields broken and turned, lying fallow until spring. The second is the ragged bit of mountains, the stately wall of rock running north and south. But the third line is made of air: A Chinook arch – purple and grey clouds smudged across the upper half of a clear sky, the underside marked with a dark band as blue as a vein under the tongue. It reminds me of another demarcation not visible here – the sea-darkened curve where sailors fall off and women stare over the edge. I still look for you. Keep my eye out for a boat with red and white sails, hovering along ahorizon. A magpie flies over my head, mocking my despair with a piercing tongue. I pick up a stone and fling it at the plump black body. I miss but the bird leaves, crying. The colour blue flashes under its wing.